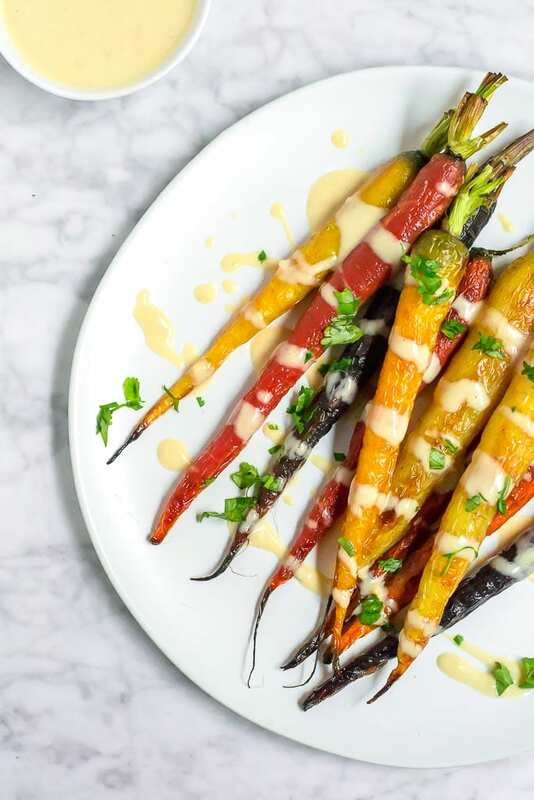 Roasted rainbow carrots with lemon tahini sauce are a great side for gluten-free entertaining. Made from simple ingredients you probably already have on hand and on the table in less than 30 minutes. If you’re looking for a way to jazz up your meal with multi-colored vegetables, look no further! Gluten-free, dairy-free and vegan. Did I think that I would ever eat 2 lbs of carrots all by myself? Nope. Did I do it? YUP! OHHH my goodness, you guys. These roasted rainbow carrots with lemon tahini sauce might be the best vegetables I’ve ever had. Seriously! I don’t cook with rainbow carrots very often, but whenever I see them at the grocery store I just have to buy them. They taste pretty much the same as typical orange carrots, they’re just so much prettier! I purchased rainbow carrot that still had the tops on them, but it’s not necessary. Again, that’s mostly for a stunning presentation. So if your carrots don’t come with tops on them, don’t fret! They’ll still be delicious! 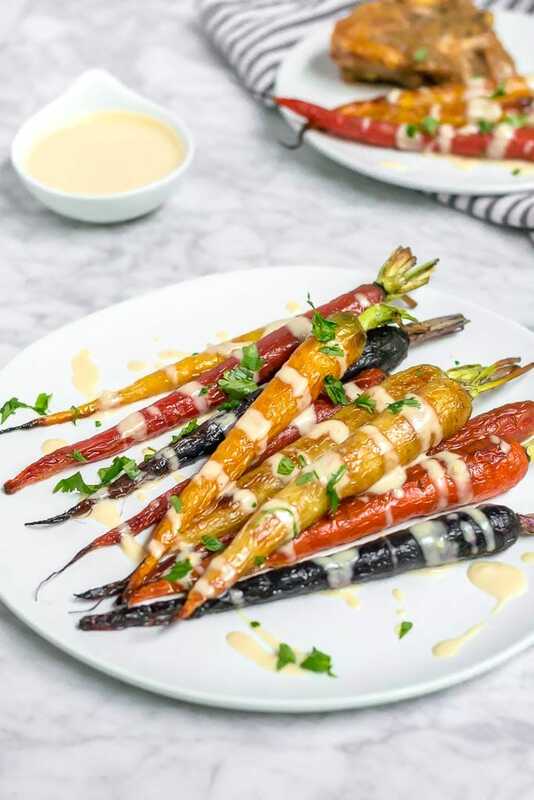 These roasted rainbow carrots with lemon tahini sauce would be a great side for any meal, but especially great for Easter or Mother’s Day. I love eating carrots raw as a snack and they’re even better when they’re roasted! Roasting the carrots brings out the natural sweetness from the vegetables. Carrots are always a vegetable I have on hand at home. They’re very inexpensive at the grocery store and are used in so many ways. From soups and stews to carrot cake to these roasted rainbow carrots. Paired with my easy lemon tahini sauce, roasted carrots are an explosion of natural flavor! The lemon tahini sauce is super simple and made with just a few ingredients. Tahini, lemon, garlic, salt, oil and water. That’s it! If you haven’t tried tahini before, it’s just paste made from sesame seeds. I always have it on hand in my house and use it in lots of recipes, like my tahini brown rice crispy treats and my curried chickpea and sweet potato quinoa power bowl. There’s so many ways to use it! The lemon tahini sauce is the perfect amount of savory flavor needed to offset the sweet carrots. I tested this recipe a few times, as usual, and every time I had the intention of serving them for dinner later that night. They never made it there! After photographing, I found myself showing down on carrots in front of my laptop and next thing I knew all of the carrots are gone! While I probably won’t suggest eating 2 lbs of carrots by yourself, they really are delicious and make a great accompaniment for your lunch or dinner! You don’t have to use rainbow carrots for this recipe. Regular orange carrots or baby carrots work just as well! Use what you have on hand! Just make sure to adjust the baking time depending on the size of your carrots. Baby carrots will cook much quicker. I left the tops on my carrots because that’s the way I found them at the store and I thought they were so pretty! You don’t have to keep the tops on or purchase carrots with tops at all. This recipe is super versatile in that way. Save those scraps! YES, carrot tops are edible! The stems may be a little on the tough side, but the leafy greens at the top have a great subtle carrot flavor. Save them for homemade vegetable broths or stocks, use as the greens in your next pesto, or even in your next green smoothie. If you don’t like minced garlic, you can definitely substitute it with garlic powder. Try 1/2 tsp of garlic powder in place of two cloves of minced garlic. Roasted rainbow carrots with lemon tahini sauce make for a simple, yet stunning, side dish for any main course. 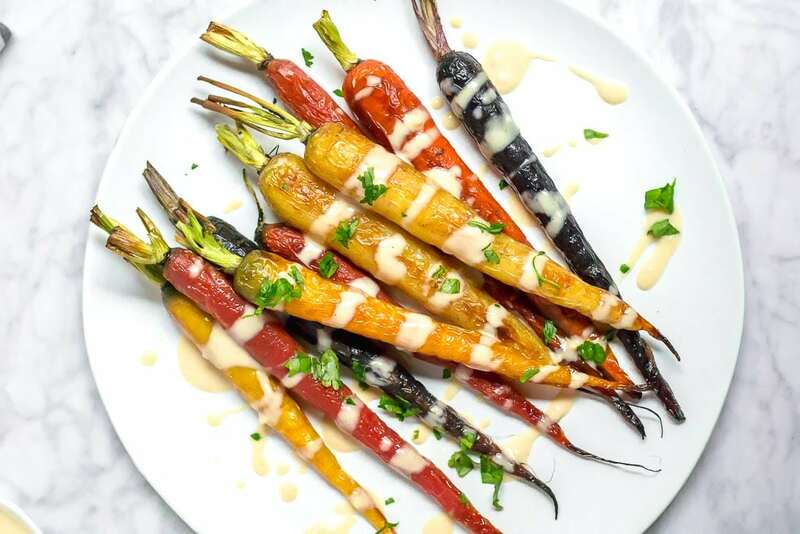 Beautiful multi-colored carrots are roasted and topped with a creamy lemon tahini sauce and a sprinkle of fresh chopped parsley. On the table in under 30 minutes. Gluten-free, dairy-free and vegan! 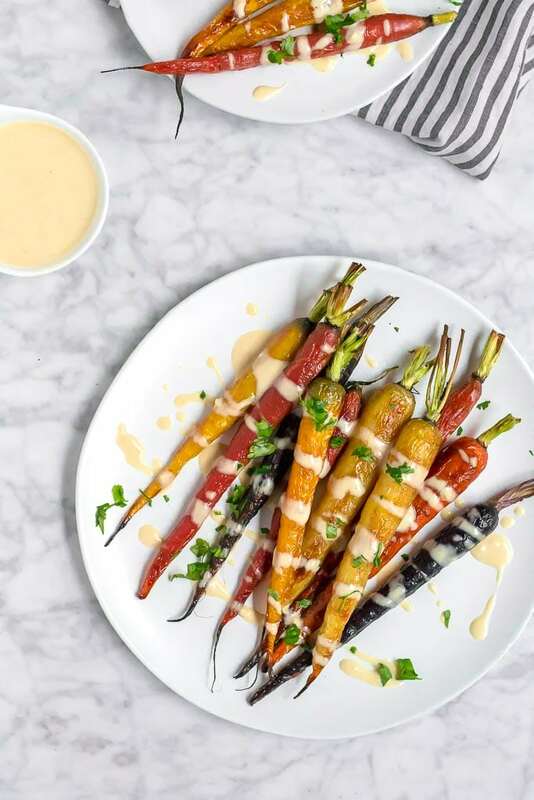 Roasted rainbow carrots with lemon tahini sauce make for a simple and stunning side dish for any main course. Gluten-free, dairy-free and vegan. Wash carrots thoroughly, removing any dirt from the surface. Dry completely. Toss carrots with avocado oil and salt. Spread in a single layer on a baking sheet. Roast the carrots at 425F for 15-20 minutes, flipping half way through. Carrots should be tender and lightly browned on the edges. While the carrots are cooking, combine tahini, lemon juice, garlic, salt, and oil in a bowl. Steam in up to 1/4 cup of water to thin out the sauce to your desired consistency. Drizzle the lemon tahini sauce over the carrots for serving. Top with chopped fresh parsley. *I used rainbow carrots in this recipe, but you can also use any type of carrots you would like (regular orange carrots, baby carrots, etc.) - You will need to adjust the cooking time accordingly depending on the size of the carrots. **If you wish, you can chop off the tops of the carrots or purchase carrots that already have them cut off. I like the look and presentation of the tops, so I left mine on. This looks delicious, and makes a perfect side for a dinner party. Thanks for sharing! Can the tahini sauce be made ahead of time? Hi Nancy – Yes, it can!